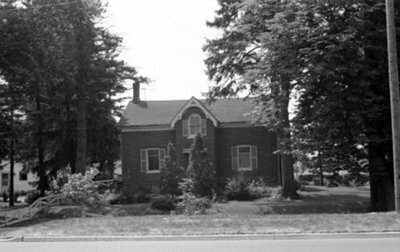 A black and white photograph of 1565 Dundas Street West. This one and a half storey brick house was built on lot 34 Concession 1 by James Almond a pioneer of Whitby. James Almond came from Lincolnshire, England and settled in the New England States. In 1837 James moved to Lot 34, Concession 1, Whitby. He founded the Almonds Methodist Church circa 1837 and was a lay preacher and Sunday School superintendent for many years. The community around Highway 2 and Lakeridge Road was named "Almonds" after him. This house was demolished in April 2013 to make way for the the link between the 401 and 407 highway expansion. 1565 Dundas Street West, July 1975, Brian Winter. Whitby Archives A2013_004_036A.